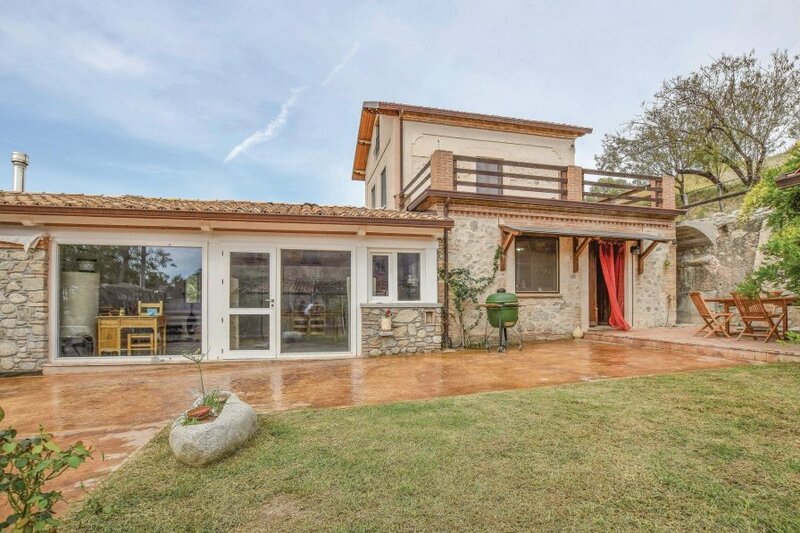 This cosy semi-detached holiday home on the Ionian coast of Calabria, in Arzarola di Santa Caterina sullo Ionio (province of Catanzaro), is surrounded by nature and just 2 km from the sandy beach. This cosy semi-detached holiday home located along the Ionian coast of Calabria in Arzarola di Santa Caterina sullo Ionio, in the province of Catanzaro, is surrounded by nature and just 2 km from the sandy beach. The property, completely fenced, is located in a green oasis, ideal for a holiday of peace. At the sight of cultivated fields and of the hills surrounding the property, guests can spend pleasant moments of relaxation in the garden or on the terrace on the first floor, while admiring the beautiful surrounding panorama. The large outdoor area and the covered veranda behind the villa with table, chairs and barbecue are perfect for outdoor meals. Located on three levels, the villa has on the ground floor a large living room with fireplace, dining room and a kitchen. 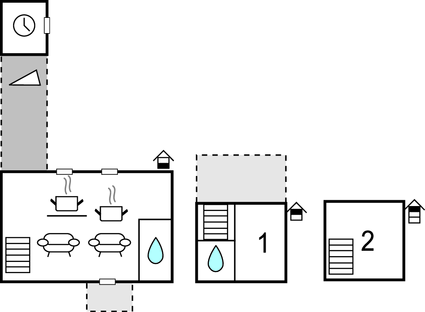 On the first floor are a bedroom and a bathroom. On the second floor, particularly suitable for children, is a bedroom with two beds (height: max 2,2 m - 1,8 m). You can also choose to cook in a nice and cosy annex, an integral part of the villa with independent access, equipped with kitchen, dining room, living room with sofa bed and a bathroom. The property offers a free tasting of oil and honey. The tourist centers of the area such as Santa Caterina and Soverato can only be reached by car. Nearby services as bars, restaurants and supermarkets are open all year round. During the summer, the territory offers various events including festivals, cultural, musical and religious events. Four-legged friends are welcome. This villa is made from brick or stone and was originally built in 1950 and refurbished in 2017. The agent has rated it as a three star property so it is a well-kept villa, equipped with standard furniture. It is also good value for money. The villaIt is located in Santa Caterina dello Ionio, only 2.5km from Sant.Caterina dello Ionio. The nearest airport is 80km away. It is set in a convenient location, 2km away from a stone and pebble beach and 2km from a sandy beach. There's also a restaurant 1.5km away.